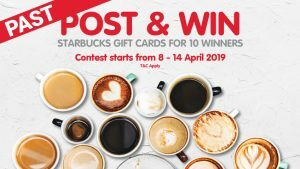 Contest entries must be submitted by 31st March 2019, 11:59pm. Entries after the contest end time will be considered invalid and is not eligible to win. Winner selection will be selected by Mudah.my Sdn Bhd (“the Organiser”). Winner selection will be at the discretion of the Organizer provided the entry meets the qualification criteria. The Organiser reserves the right to select winners from Mudah.my website within the stated categories during contest period. Each winner is eligible to win once during the contest period. 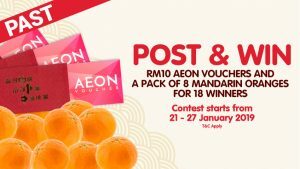 Announcement of winners will be made on http://deals.mudah.my/category/post-win/ within 2 weeks after the contest end date. Ten (10) Winners will be selected to win 1x Petronas Gift Card by the Mudah.my Sdn Bhd (“the Organiser”) judges. All winners within “Klang Valley” have to collect the prizes at Mudah.my office. If winner can’t collect the prize, winner could send their representative to collect on behalf by providing a photocopy of winner’s IC. Winner have to provide representative’s “Full Name” before arranging the collection on behalf of he/she. 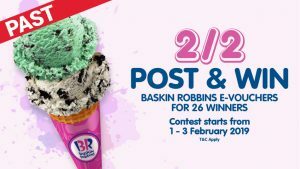 Outstation’s winner prizes will be delivered via mail within 2-3 weeks after the winner’s details have been confirmed. 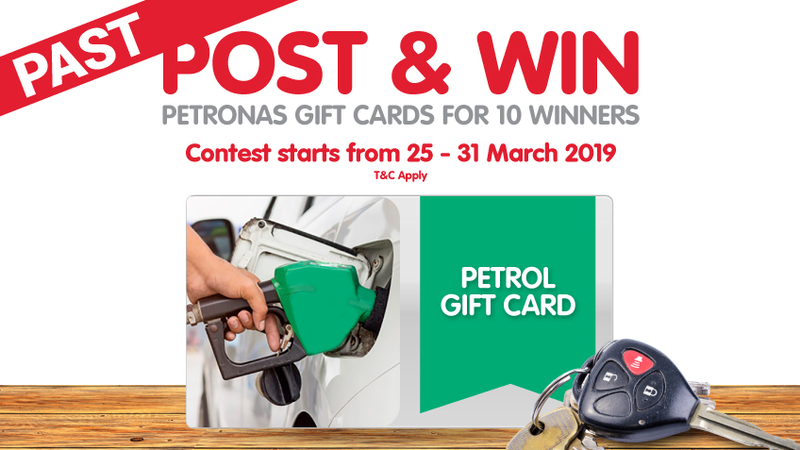 The Post & Win Petronas Gift Card Contest is open to all Malaysian residents age 18 and above as on 25th March 2019. Eligible Participants under the age of 18 are required to obtain parental consent prior to participation in the Contest. By participating in this Contest, such consent is deemed to have been obtained. 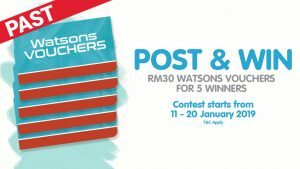 For such Participants, the Organiser considers it the responsibility of parents and/or guardians to monitor Participants’ participation in this Contest. Neither Organiser nor employees of Organiser, “Mudah.my Sdn Bhd”, and all of their respective partners, parent companies, divisions, subsidiaries, affiliates, trustees, advertising, promotion and public relations agencies, and their respective officers, directors, employees, agents, independent contractors, representatives and agencies are not eligible to participate in the Contest and/or win a Prize (as defined above). Immediate family members of employees and persons living in the same household as such employees (whether related or not) are not eligible to win. For the purposes of this Contest, “immediate family members” is defined as spouse, domestic partner, mother, father, grandmother, grandfather, children, siblings and their spouses. By participating in this Contest, Participants fully and unconditionally agree to and accept the official Terms & Conditions as stated in this document and decisions of the Organiser and explicitly consents to her/his name and picture being published on the Internet (homepage and Facebook site of the Organiser), and possibly also in the print media of the Organiser in the event of winning. By entering the Contest, the participant explicitly consents to the Organiser storing necessary personal data of the participant. The Organiser wishes to point out that all personal data as per above will not be made available to third parties. The Organiser reserves the right to amend these Terms and Conditions without giving prior notice. 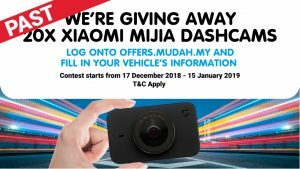 For further enquiries regarding this Contest, please contact us via email at marketing@mudah.my (10am – 5pm, Mondays to Fridays, excluding public holidays) or leave a Private Message on the Organiser’s Facebook Page www.facebook.com/mudah.my. 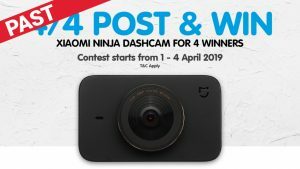 20x Xiaomi Mijia Dashcams To Be Given Away!